Ubiquity has rewards. If there is any technology company of any kind that is ubiquitous it is Salesforce. In the last decade — due to their clear vision, execution, cautious steps forward, willingness to change what doesn’t work, and their ambition to run the whole “business web” — they have become a predominant name and a force of nature led by one of the most visible technology executives in the world. Marc Benioff, the recent recipient of the TechCrunch 2015 CEO of Year, is a face that millions in the business world recognize because of his wide scope of interests on the world stage. All that is well and good, but that doesn’t get you a Watchlist Elite status. Your company does. What is about this company that makes the difference? Salesforce continues to be, well, Salesforce – and that says it all. Here’s what makes the above sentence interesting: I would venture to guess, when you read that, your response was something like, “I know, right?” That proves, right there, that Salesforce deserves their 2015 Watchlist Elite award — because they have done what no other company in the technology world has: They have won mindshare at a level so substantial that all other companies — including those much bigger than they are — compete against them. To show you what their mindshare means, I’ll tell you a brief story. I was speaking with a tech guy a few days ago and he told me that he worked for this company who — when they realized that their homegrown technology wasn’t working for them — just went and bought Salesforce because that’s simply what they thought they should do – sight unseen, no vendor selection. That may be a bit extreme, but that also is indicative of how much of the mindshare of the tech-interested world Salesforce has captured. To support that premise even more, from my own personal experience, I constantly hear from the newer tech startups that their first integration is with Salesforce. Not simply because Salesforce makes that rather easy with their open API, but also because Salesforce is the one everyone hears about. That’s the genius of the company when it comes to their marketing, outreach and presentation. Aside from Marc Benioff — who, aside from being a terrific CEO, is arguably the world’s best single marketer — the rest of the company does several things superlatively. Their outreach is equal to the best in the world. For example, their analyst relations team run by John Taschek and managed by Steve Gillmor, Carolyn Roualdes, and Anne Chen do all the things that an analyst relations team are supposed to do – and do it superbly. Briefings happen, they know who the analysts are individually and personally, not just what they are; logistics are taken care of in a timely way. They are creative and, honestly, just really good human beings. I’m not sure they could do better than they do. The other thing that I would be remiss to not mention is their deep commitment to corporate social responsibility. More so than any company I know of, they spend thousands and thousands of hours and millions upon millions of dollars via the Salesforce Foundation to support worthy causes. Their name for the approach is the 1/1/1 program. That means that as a company, you donate 1 percent of profits, 1 percent of equity, and 1 percent of employee hours (which means the employees retain their pay while taking 1 percent of their time to do good works) back to the communities you serve. Several companies in the Watchlist touted the community hours that their employees gave back, but after investigating the programs further, a too-significant number of them weren’t paying their employees for that time. At best, they let the employees do it without penalty during some of their work hours – but of course, they were unpaid, which to me, while noteworthy, is a half measure. But Marc Benioff, who is inseparable from his company, takes this customer focus even further. In recent weeks, he has been all in on actively promoting a deep customer-engaged outlook – not just for Salesforce, but for all companies. For example, in early January at the Forbes Brainstorm conference, he declared that the CEO now has to own the customer relationship. Just a few days ago, he wrote a piece for the Huffington Post where he declared that shareholder value is the “dumbest idea ever” because there are more stakeholders than just shareholders – and they include customers, employees, partners, etc. So they are getting not only laser focused themselves in this fashion — what I call “customer engaged” which is a few proactive steps beyond “customer-centric” — but also becoming advocates for this level of corporate engagement. These are multiple examples of what makes Salesforce so top of mind to the business world at large. But what drives them is a laser-focused execution on their long-term game plan, supported by a vision that is consistently aligned with the changes in the market and in the climate and to some extent the larger forces that govern the political, economic and social currents. 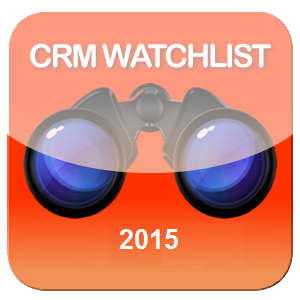 CRM is an entry point. What we (Salesforce) are planning to be is the business web. That means that we want to be the platform for all business apps. When a business starts its business day, they open up their apps on us and all day, all their apps are running on our foundation. They have never for a single moment wavered on that idea. They were determined to be the platform upon which all business applications run in 2002. They are still determined to do that. They have spent the last more than 10 years, not only focused on the prize, but building the architecture to do that with, first, force.com, and now with the integration of force.com, Heroku, and Exact Target’s Fuel platform, Salesforce1. They improved a great deal on the Salesforce1 offering in 2014, and announced the new improved edition as their Customer Success Platform (Salesforce1 with the added power of their mobile application development component Lightning) at Dreamforce in late 2014. They finally have the components, APIs, and architecture to at least attempt to realize their long term and long-time vision. Will they? I doubt that, to be entirely candid. That is a huge ambition, but they’ve built much of what they need so that they can build a substantial ecosystem of offerings for their present and future customers – enough to make them happy, then allow Salesforce to spread its wings beyond just CRM-related activities and to provide them with the stairwell to continue their ascension. What also makes them Elite is that they have a keen sense of the market and what people are looking for. In the last year, they have gone from Marketing Cloud fairly light weight pretenders to Marketing Cloud serious heavy weight contenders, and possibly — though I’m not ready to say this yet — leaders, with the integration of Exact Target and the development of the powerful Social Studio, led by former Radian6 rock star and Chief Adoption Officer of the Marketing Cloud, Ryan Strynatka. There is still much to be done, but arguably, they have the greatest array of individual market ready assets of any of the marketing clouds – which helped them leap from worst in 2013 to first in 2015. The bright light star power of this company is further verified in a way that most wouldn’t think of as something that validates their market leadership. Right now, if you look at the list, they have the vast majority of extremely large consulting and systems integrator firms working with them – with practices devoted to them. Why is this meaningful? The model that that companies like Accenture, Deloitte, and PwC have worked on pretty much for their entire existence has been a big project model when it comes to technology implementation. Multi-million dollar selection, planning, and implementation projects, based on licensed on premise software. Think of what it took for Salesforce to be able to convince these companies — and there are a myriad with Salesforce practices — to change the model to subscription-based services. But scale does matter and I have heard tell of one or two of the systems integrators with implementations of Salesforce in the hundreds of thousands of seats. So we are not talking small here. But please don’t underestimate what happened here to make this reality. A very old school model had to be discarded and replaced by something very different from what the extant companies were used to. Which is only done if you have the mindshare and the credibility to pull it off. Finally, they are providing cutting edge customer facing services with their “Connected Customer” work that is spearheaded by industry veteran and awesome human being, Charlie Isaacs, CTO of Salesforce’s Customer Connection. This unit co-creates leading products with their customers. To get a good feel of what the thinking is behind Customer Connections, please read this interview Charlie did with Kyle Lacy of Salesforce Exact Target last July. What you find is that Salesforce not only understands the markets it plays in, but sees them in the larger context of the meta-trends defining the transformation of the planet – and proactively builds their model accordingly. So what can they do better, since they seem so good? Well, again, like their Elite brethren, good doesn’t mean perfect, so there are things to do. Think ecosystems…again –Last year, I lamented the fact that Salesforce does not have a strong ecosystem perspective. Sadly, that doesn’t seem to have changed at all. You not only see the impact in their view of partnerships — which is to minimize the value of the strategic partners, and focus most on the app exchange (conceptually) — but also in the (lack of) stitching of products and services.This is the time for Salesforce to step up, review what it takes to provide a complete set of products, services, tools and consumable experiences to companies that serve the “Connected Customer” (more on that in a minute) – and create a strategy for its provision. They don’t need to build it all. They don’t need to have it provided among a potpourri of AppExchange laundry list components. They need to be able to provide a cohesive narrative that tracks with their vision that says, to achieve this vision that you, customer to be, bought into, here is what you need and here is the ecosystem we can provide to make sure you get it. Right now, that is NOT the way that they are thinking, though there are a number of their key leaders who do think this way. Salesforce needs to make this less isolated individual thinking and more by design for the company as a whole. It takes them to the next level. Better integration between Marketing Cloud offerings – The Salesforce Marketing Cloud is probably, given its assets, the most comprehensive of all the marketing clouds, which is HUGE progress for Salesforce and something to be very proud of.The next step is to provide the stitching so that it’s not just campaign management AND journey building AND email marketing AND Social Studio AND well, you get it. The strength of this offering is in its potential but right now; it has to be made much more cohesive than it is. They are positioning it extremely well with its tagline – “The future of marketing is 1:1 customer journeys” which goes to the heart of customer engagement. In this newly transforming business world, marketing has gone from its traditional message pushing to being more of a first line of engagement. They took a big step last year when they stopped calling it the Exact Target marketing cloud and made it the Salesforce Marketing Cloud. The next step is provide an offering that takes care of marketing as the first line of engagement. A look at Marketo’s offering, though less than Salesforce in assets, is a good example of a coherent point of view and framework – the stitching. I’ll leave it at that for the moment, both on elaborating on engagement (much more as the year goes on) or on Salesforce product integration. Refocus marketing around Internet of Customers (IoC) and Connected Customers – Salesforce goes through a lot of messaging changes and positioning shifts, always trying new approaches, trying to align with the market at hand. In 2013, at Dreamforce, they nailed it big timewith the Internet of Customers and the Connected Customer as the focus for their overall vision, offering, and positioning as a company. Even though they made a lot of positive strides when they built out the discussion at Dreamforce 2014 around the Customer Success Platform, for some obscure reason, there was literally no mention of the Connected Customer or the IoC either. The result was that Parker Harris, who gave a brilliant presentation on a B2C example of Coca Cola in Germany and the B2B case study of Honeywell (warning: to get this document, you’ll have to register), wasn’t able to wrap two extraordinary case studies in how 21st century companies have to realize their objectives, in the cloak of the Connected Customer or the B2B Internet of Things/Customers – the Industrial Internet.Yet, Salesforce’s true power lies in its ability to actually realize the Internet of Customers and help customers in both the B2C and B2B world. That’s why the projects being led by Charlie Isaacs are so important to Salesforce’s future. However, they have to get their messaging back on track and keep the focus on the Connected Customer, The Internet of Customers and The Customer Success Platform. That is their true north. Step up the Analytics Cloud – This is simple. The Analytics Cloud version (built on Wave) released to a lot of hoopla was a version 1.0 with some good mobile capabilities and basic analytics packages. They need version 1.5….now. They took a big and important step by even having an initial release, but it’s been months and the next evolution of the Analytics Cloud is due to maintain some credibility.They are up against some powerful competition with mature and powerful analytics platforms and applications from SAP, SAS, Oracle, and on the engagement side, Verint and NICE, and too many others to mention here. Indicative of the fuzziness around the upcoming improvements — which are supposedly coming this month — is this article on CMSWire that both speaks to some customer momentum and yet finds Salesforce unclear about what it intends to do to make this competitive with the bigger players. Kudos to Salesforce for taking care of a big hole in their ecosystem, but once you fill the hole, you have to build the foundation and the house. Time for the version 1.5 foundation. There is no question of Salesforce’s commitment to its vision and the execution of the associated game plan. Their status as an Elite impact player is unimpeachable. I see nothing but continued success for the next several years all but guaranteed. But, to stay at the top, you have to operate at a level unlike anyone else’s. Can Salesforce do that? I’m betting that they can. Or else, why would they be Elite?